App42 Push Notification now supports WNS (WIndows Push Notification Services) for Windows Runtime Apps. This will enable sending toast, tile, badge and row updates from App42 to your Windows Runtime Apps. Before you can send notifications using WNS, your app must be registered with the Windows Store Dashboard. This will provide you with the credentials for your app that your cloud service will use in authenticating with WNS. These credentials consist of a Package Security Identifier (SID) and a secret key. 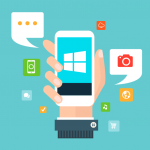 We have written the complete tutorial and sample to get started with WNS Push Notification, please see our tutorial section and start sending Push Notifications to your WinRT apps.